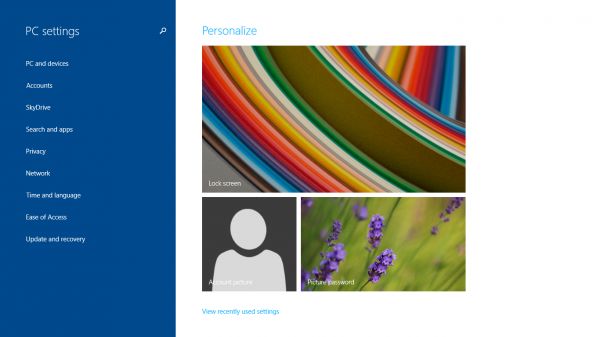 While desktop environment of Windows 8 and Windows 8.1 continues to provide an advanced way to configure and personalize the Windows settings, the Modern or Metro Windows 8 user interface now adds an easy way to configure several essential personalization and system settings. More importantly, PC Settings is the only way for Windows RT users to configure to configure their system. For example, such settings that can be configured via PC Settings include user accounts, account picture, password, fingerprint options, lock screen, display, default save locations, download via metered connections, mouse, touchpad, autocorrect misspelled words, app switching, corner navigation, screen turn off, computer sleep, AutoPlay, SkyDrive (OneDrive), settings sync, searching, sharing, notifications, quiet hours, default apps, privacy, proxy, HomeGroup, date and time, location, language, easy of access, Windows Update, File History and recovery. In addition, you can also view PC info and app size via PC Settings too. Here’s how to open PC Settings screen in Windows 8, Windows 8.1, Windows RT and Windows RT 8.1 and future Windows versions. There are a few ways to do it, so choose the one that you prefer. Open the Charm bar by moving the mouse to one of the corner on the right, or sliding in from the right, and select Settings, or press the Windows + C keyboard shortcut. Then, click or tap on Change PC Settings to open the PC Settings. Press Windows + I keyboard shortcut. 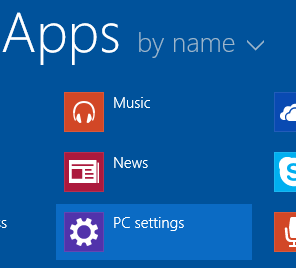 Then, click or tap on Change PC Settings to open the PC Settings. In the Start or Apps screen, search or locate the PC Settings, and click or tap on the tile.